Books for A Change: What's Next After Now? The author, whose seminal work Doing Nothing: Coming to the End of the Spiritual Search, helped guide spiritual seekers to the experience of the present without practices, now takes us one step further into the transforming experience of a “post-spiritual” life. Spiritual seekers by the thousands have come to the end of the masters and gurus, the religions and philosophies, and the process of “getting better.” The spiritual marketplace has discovered the “power of now” and learned all about the present moment — but is that it? Is it that simple? What’s next after now? When we give up spirituality –– not out of a reaction or because we have completed some mythical journey –– and we drop into the present, what is the post-spiritual reality and how do we live it creatively? Steven Harrison probes these questions, deepening the discovery that the present is a place of boundless creativity in which we can be constantly challenged and inspired to fulfill the wonders of the human potential. 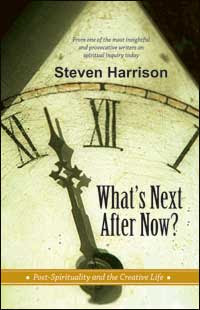 Steven Harrison is one of the most insightful and provocative authors in the arena of spiritual inquiry today. ISBN: 81-89658-11-5; Price: Rs. 250; Pages: 170; Size: 5.5 X 8.5 in.